May 25, 2016, 6:30 p.m.
May 23, 2016, 7:00 p.m.
Alyson and three other authors discussed the experience of writing and publishing their first books. See also Alyson's interview with SmokeLong Quarterly, which published Alyson's story Cooped. 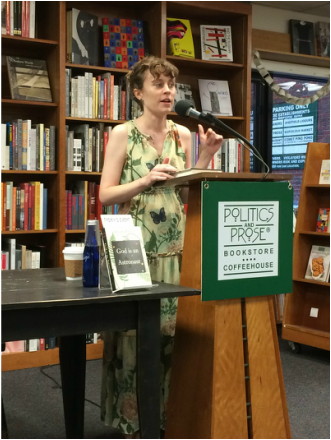 Alyson at Washington, D.C.'s Politics and Prose bookstore. Alyson and Alan Cheuse at The Hill Center in 2012.